“Linda Popky Selected As “Top-Idea Maven” by The Woman’s Advantage®” – Entrepreneur’s Advice Featured in 2016 Woman’s Advantage® Calendar. “Nine Marketing Books to Give This Holiday Season” by Anne Janzer. Marketing Above the Noise is one of the 9 books. Businesses Will Feel Impact of US Presidential Campaign Throughout 2016 – Linda comments on the presidential campaign and personal branding. Free Trade Agreements Come With Heavy Baggage – Linda Popky talks about how free trade impacts marketing, not just manufacturing. “Hitting It Out of the Park: Making the Most of Presentations to Management” by Linda J. Popky, a chapter in PR News’s The Book of PR Measurement Strategies & Tactics Vol. 9. “Market Above The Noise!” podcast with Linda Popky on Newbie Writers. “Changing the Conversation: How Independent PR Professionals Can Differentiate Themselves in a Crowded Marketplace” podcast by Linda Popky hosted by PRSA. See related blog post (Aug 14). Organizational Actions Ensure Entrepreneurial Spirit Thrives – Linda Popky talks about entrepreneurialism as a mindset. “Technology: Friend or Foe?” by Linda J. Popky in Sales + Marketing Ideas. “Everything You Need to Know About Avoiding Social Media Faux Pas, You Can Learn from TV Detectives” by Linda J. Popky on commpro.biz. “The Three Keys to Mastering Marketing in Today’s Noisy Marketplace” by Linda Popky on MarketingProfs.com. Linda offers a second opinion on relying on a single marketing tactic in “How an Automated Scheduling Tool Helped a Wellness Center Shape Up” in Entrepreneur magazine. Challenges of a Growth Economy Should Not Be Underestimated – Linda Popky comments on planning ahead. “Cut Through the Noise: Make Your Marketing Matter,” Women in Consulting (WIC) Webinar. “When You’re The Only One: How To Leverage Being The Only Woman” on Startup Nation. “Linda Popky – Break Free and Get Noticed in an Overcrowded Marketplace,” audio interview by host Bob Garlick on Business Book Talk. “Stand Out Above The Noise With Grounded Marketing” on Investor’s Business Daily. “Marketing Above the Noise” on actionablebooks.com. “How to Market Above the Noise” on skipprichard.com. “Mine The Measurements That Matter” in Sales & Marketing Management. “Books You Should Read” on businesstraveller.com. “Don’t Let Marketing Tech Sabotage Your Success” by Linda J. Popky on chiefmarketer.com. “Marketing Above the Noise” book review on Midwest Book Review. Audio “Interview with Linda J. Popky” on My Quest for the Best with host Bill Ringle. “Top 10 Advertising Myths” by Linda and Judy Popky in Strictly Marketing Magazine (May/June issue, pages 21-22). “Marketing Above the Noise” book review on getabstract.com. Read review in Portuguese. Interview on “EGG Live!” (Executive Girlfriends’ Group) with host Chicke Fitzgerald – Listen on BlogTalkRadio or iTunes. “Networking Can Help You Get Heard Above the Noise” audio interview by Lisa Platt of Business Networking Made Simple. “Linda Popky: Marketing Above the Noise” audio interview on 33voices. See also: Linda’s profile and a 1-min audioclip. Preparation, Rapid Response Key to Surviving in Era of Data Breaches and Hacks – Linda Popky comments on brand impact. “Is Social Media Helping or Hurting Your Company?” – American Management Association®‘s Playbook. Bibliomotion Launches ‘Marketing Above the Noise’ by Linda J. Popky on PR Web. Linda published a manifesto, “Being Heard in a Chaotic World,” on ChangeThis. Download the article. Linda wrote a guest column, “Being Heard: What Successful Consultants Can do to Get Above the Noise,” on Alan Weiss’s blog, Contrarian Consulting. Read the article. Linda is interviewed in NGDATA’s “24 Marketing Experts Reveal the Most Effective Ways to Leverage Big Data in Your Marketing Strategy.” Read the article. 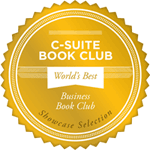 Linda Popky’s Marketing Above the Noise has joined the C-Suite Book Club. “‘Marketing Above the Noise‘ – 5 reasons to read this book” – by Mike Gospe, author of The Marketing High Ground. “Why 5% Succeed – Insights with Linda Popky”. Video file: 35 mins. “When You’re The Only One: How To Leverage Being The Only Woman In A Room Of Entrepreneurs To Create Your Own Success”.